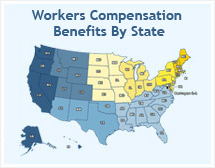 Workers-Compensation-Law.us is dedicated to helping employees who suffer from job related injuries or illnesses get the benefits that they are entitled to by law. Our knowledgeable Workers' Compensation attorneys will provide FREE HELP with a no-cost claim evaluation and consultation. Whether filing your first Workers' Compensation claim, experiencing retaliation from your employer, or desiring more information on your case, we are here with the expertise to get you the maximum medical coverage and wage replacement benefits you deserve. If you encounter a problem with this website please email webmaster@Workers-Compensation-Law.us The above email address is only for reporting problems with the site functionality. Questions about a workers' compensation claim or application sent to this address will not be responded to, as only a qualified representative or attorney can answer them. For a FREE consultation to answer any of your questions Click Here. Thank you! WE ARE HAPPY TO BE OF SERVICE!